For what it is worth, I am not generally a “tour” kind of person. My first preference is to plan my own trip, and travel at my own pace, as opposed to being wrangled like a wayward cow. But in a place like India, a tour (and a fabulous tour guide – more on her later) that connects the dots – that is – that organizes the travel between sites and cities, pre-books hotel stays, conjures up knowledgeable local guides who have good English speaking skills, and greases passage (on bicycle rickshaws!) through unwieldy crowds, takes what could be a truly overwhelming and exhausting experience, and makes it doable. 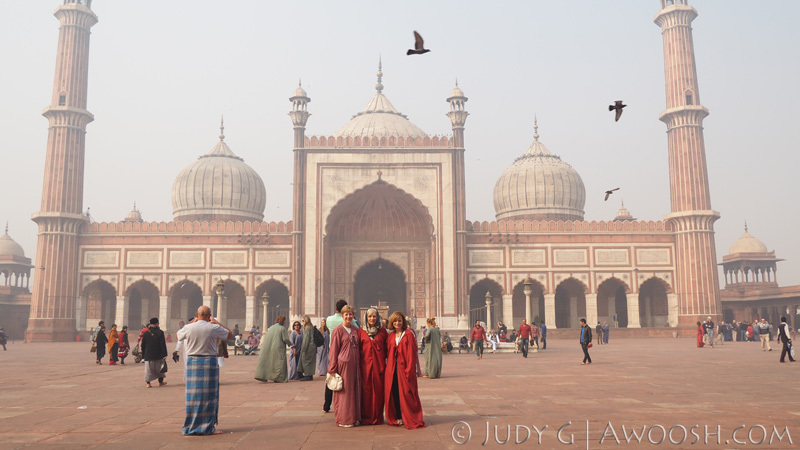 A brother-and-sister-in-law had been to India on a recent tour, with a company out of New York called SmarTours, and highly recommended it. A bit of decision-making ensued amongst the ladies about whether to choose the short, 8 day tour on offer, which really would just touch on some of the many attractions in the ‘Golden Triangle’ of Northern India, and then add on a bit of relaxing beach time in Goa, or Sri Lanka, or the Maldives. The second choice was a much longer tour – 15 days – that included a side trip to Kathmandu for a couple of nights. We wistfully ditched the call of the beach, and decided to immerse ourselves by doing the longer cultural tour. I think it was a good decision. And, just so you know, the travel days to/from New York’s JFK airport on Scare, er, Air India are considered ‘part of the tour’, so are included in the 15 days that they advertise. SmarTours operate tours in many interesting locations around the world, and several people on our trip had done previous outings with them in other countries and were happy to go with them again. As I understand it, SmarTours’ business model is to hire tour leaders from tour companies located in the country of travel. In India, they contract guides from a company called A Passage To India. And this brings me to Bonnie Backer, an American from the east coast who has been living and working in India and Nepal for over twenty years. So, back to the beginning. We flew to New York as our flight to Delhi originated there. The JFK-Delhi-JFK flights are included in the tour package price. You can opt out and make your own arrangements, but they don’t affix much value to the Air India flights, for which they apparently get a very robust group discount. We had a great weekend in New York before heading to India. Who knew you can get a nice hotel, with relatively large rooms, and breakfast included, a couple of blocks from Times Square and the theatre district, with a full time, extremely helpful concierge, on a reasonably quiet street, for a decent price? This is a hot tip folks: The Belvedere Hotel. We booked about six months in advance and got a very good rate, although once you convert those robust US bucks to weenie Canadian dollars, it doesn’t seem such a great deal. Our Air India Boeing 777 flight departed JFK in the early afternoon. SmarTours block book the seats in the back of the bus for their passengers, and there is no way to get on Air India’s site and change seats beforehand (believe me, we tried). I highly recommend getting to the airport at least four hours before your flight (it looks like the check-in may open as much as five hours before the flight), so you have a half decent chance to grab something better. The aircraft that is being used (daily) for the JFK to Delhi run is very tired, and badly in need of a refurb. Many of the personal, video on demand screens were not functioning on our flights to and from India. On a 14 hour flight, no movie is a very sad thing. Food and beverage were okay, but bring some snacks and a big jug of water, as once the meal services were done, the crew appeared to completely vanish. Also, be prepared for Air India musical chairs. Our flight out was about three quarters full, and as soon as the crate was in the air, many of the passengers scooted around the plane and took up new seats. We were quietly high-fiving just before take off that there were no squalling babies seated too close to us (there were a lot of infants on the flight), but then a woman with The Child Who Will Not Be Comforted sat right across the aisle from me. Without earplugs, and noise-cancelling headphones over top of those, I might possibly have become murderous after 9 hours straight of a wailing kid. The Sikh gentlemen sitting just in front of us decided to pull an all-nighter and were standing in the aisle, speaking in loud voices, even after the crew turned down the lights to let people sleep. All. Night. Long. Seriously people? And it worked! We did eat bananas and oranges that we purloined from the breakfast buffets at the hotels, which we washed and peeled, but we avoided all the awesome looking cut up fresh fruit on offer, and the lovely looking salad bars at dinner. We ate cooked vegetarian (what the Indians call ‘veg’) while traveling in India and Nepal, and loved it – spicy dal, paneer, tandoori veggies, and garlic naan bread were the staples. I didn’t take a complete survey, but by my observation, many of our tour group did get sick at some point or another on the tour. The biggest irony is that instead of the dreaded Delhi or Khatmandu Belly, the four of us suffered the opposite problem. Senna is your travel buddy. So, bleary-eyed, we staggered off the plane in Delhi airport – which was a pleasant surprise, being a modern structure with decent amenities and the ubiquitous mall-like experience that is now all the rage for international airports. The immigration process was pretty simple, as we all were required to get an Indian Visa before arrival. That was a boondoggle that I’ll try to share in a future blog. Our bags kicked out and we looked for the SmarTours rep who was there to greet us, get us on the bus, and deposit us at the first hotel of our tour – the rather grand Le Meridien Delhi. We had a nice dinner in the Indian restaurant at the hotel, and popped ourselves into bed, ready to tackle India the next day, after a big sleep. In future instalments about these travels in India, I’ll be sharing photos and information about some of the amazing locations that we visited, along with a few show and tell stories. I’ll also be providing contact information for Bonnie, as not only does she do large guided tours for companies like SmarTours, but she is also available to put together smaller, private group trips with custom itineraries. This entry was posted in Travel, Trip Reports and tagged Bonnie Backer, Delhi, India, SmarTours. Bookmark the permalink. Bonnie was our amazing tour guide in 2007. Trying to get in touch with her to arrange trip for friends to South India. Do you know how to reach her?? Hi Etta, you can reach Bonnie here —-> dreamingofindia@aol.com She is also on Facebook – search Bonnie Backer.